Amazon loves talking about its drone delivery system despite the fact that it’s nowhere near complete. When the company made its first drone delivery earlier this month, the aircraft carried a bag of popcorn and Fire TV box a measly half-mile. Nevertheless, Amazon is exploring an even more ambitious idea: flying warehouses. 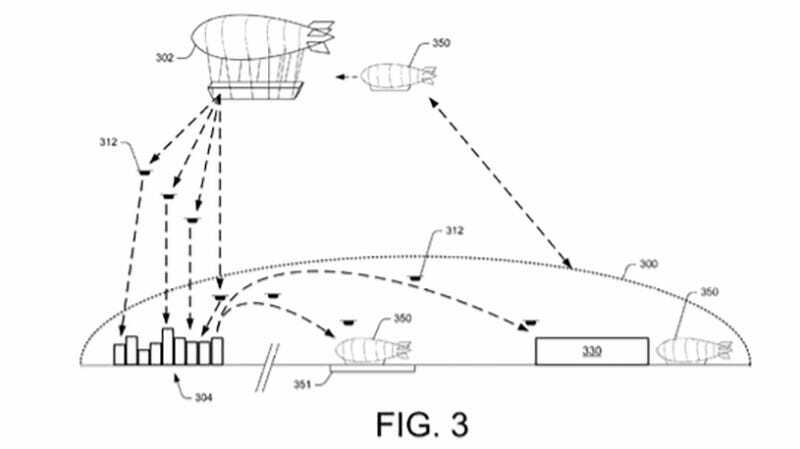 A patent awarded to Amazon in April—but only recently discovered by BBC News—shows a concept that would suspend huge flying warehouse in the sky and equip it with a fleet of drones that would deliver goods from the flying warehouse to the ground. These so-called “aerial fulfillment centers” would be used in places where lots of people have suddenly gathered, like a sports event or music festival, to help deliver things like food and souvenirs. The patent also describes how “shuttles,” or smaller airships, could be used to transport workers to and from the airborne warehouses. While the idea might sound cool at first, consider this: what would happen to the people below if the flying warehouse fell from the sky? While it could reduce delivery times, the concept is still utterly ludicrous. According to the patent, the shuttle drones would climb as high as 45,000 feet where the airborne warehouses would be hovering, and the smaller airships would expend almost no energy on their way down to Earth. The shuttles would also be able to “travel long horizontal distances (miles) from the AFC using little to no power” by relying on its flaps and ailerons alone. The warehouses would “gain their lift from gas that is less dense than the surrounding air, such as helium or hot air” in order to reduce power consumption too. They would be equipped with battery-powered charging stations so shuttle drones would also be able to recharge in between deliveries. The goal of the whole operation would be to reduce power consumption with each delivery and reduce waiting times. The patent explains how “the power required to complete an item delivery is substantially reduced” by using an flying warehouse because shuttle drones do not have to use power to fly between the warehouse and delivery spot. The shuttles would rely heavily on gravity to reduce fuel consumption—one of the biggest challenges to drone delivery and the main reason why Amazon’s first commercial drone delivery was less than a mile. It’s worth mentioning that most patents never end up becoming products, so this could prove to be more a concept that reality. We sure hope so, because it’s hard to imagine having hundreds of pounds and thousands of dollars of goods suspended in the air just to reduce delivery times. It also sounds like an air traffic control nightmare waiting to happen. The concept is certainly futuristic, and it might be a reality someday in the far future. But for now, this is just another way for Amazon to use its drones as a marketing ploy.